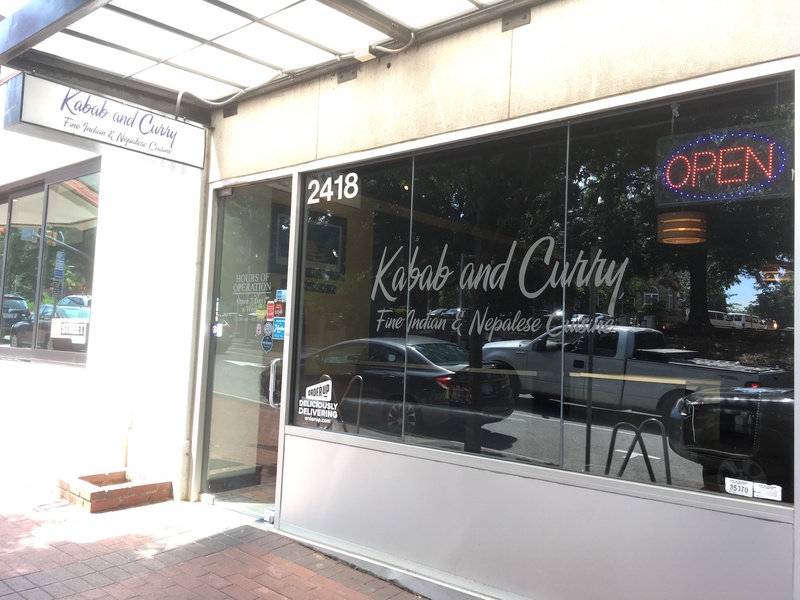 Kabab and Curry Nepalese & Indian Cuisine, located between H-Street Kitchen and the future site of Bocci Trattoria & Pizzeria, lives at the heart of Hillsborough Street. While walking to class or waiting for the bus, I often notice the delicious smells coming from the restaurant and wish that I had more time to stop in and treat myself to all this restaurant has to offer. 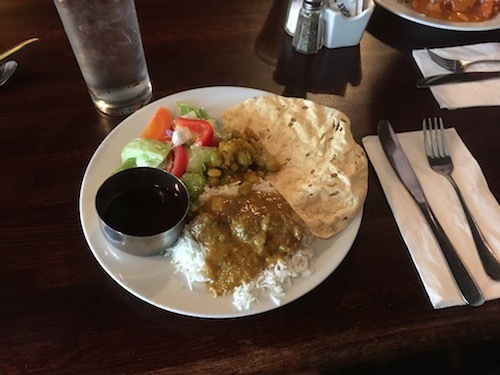 I’ve been to Kabab and Curry’s lunch buffet a few times in the past, but this week I was able to go for lunch with a friend who had never been before. 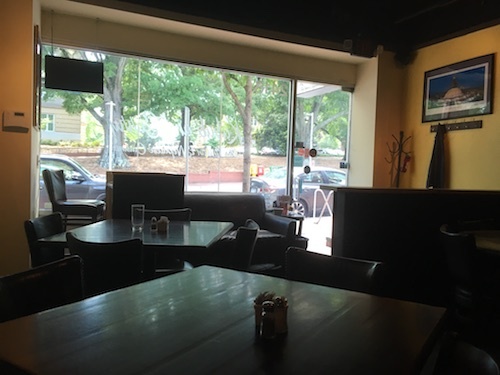 We found Kabab and Curry’s fairly unassuming exterior, and got ourselves inside and away from Raleigh’s hot summer air. 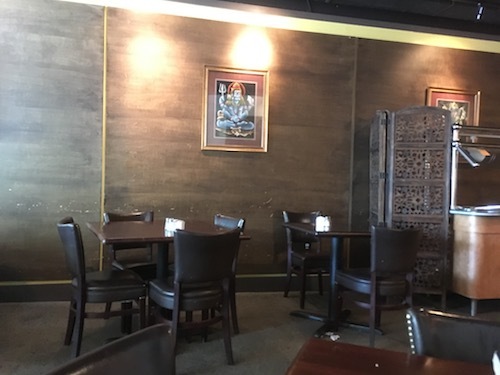 The atmosphere was cozy, with the shades of brown, yellow, and mahogany seeming to complement the rich brown colors of many of the restaurant’s dishes. The lighting provided atmosphere during the day without being so dim that we were unable to see. Once we were inside, we were immediately greeted by a friendly host asking us if we were here for the lunch buffet and we were led to a table. My friend commented that the buffet looked great and I noticed that the options seem to have been updated since the last time I was here, and I had much more to choose from. We chose to pair our buffet selections with warm garlic Nan. Although we were dining fairly late in the lunch period, the food was still hot and fresh, and I filled my first plate knowing I would be back for more. Although I didn’t go for dinner, I glanced at Kabab and Curry’s dinner menu and I noticed that the number of listed vegetarian entrees almost outnumbered the number of non-vegetarian entrees. Considering many establishments only serve one or two vegetarian dishes, I was very impressed with this selection. I wondered why I had never stopped by here for dinner, and made a mental note to come back at some point to try at least one of these delicious sounding entrees. My friend couldn’t stop talking about how great the food was for the price, since Kabab and Curry serves this diverse and delicious lunch buffet for only $8.95 on Monday to Thursday, and $11.95 on Friday to Sunday. 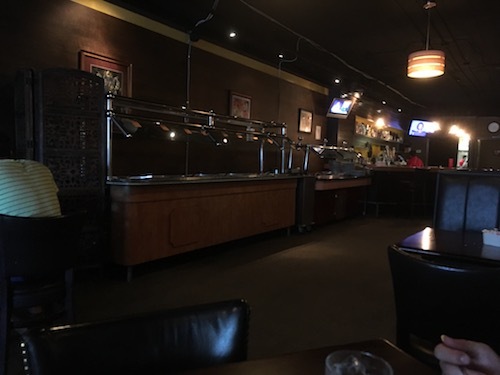 The restaurant also boasts a well-stocked bar tucked behind the buffet area, provides catering services, and offers the option to order take out via OrderUp. Whether you’re looking for some delicious midday Indian & Nepalese cuisine at an amazing deal, or an atmospheric location for a relaxing dinner, Kabab and Curry is sure to satisfy. Lunch Buffet Hours: Mon - Sun: 11:30 a.m. - 3:00 p.m.
Dinner Hours: Mon - Sun: 3:00 p.m. - 10:30 p.m.